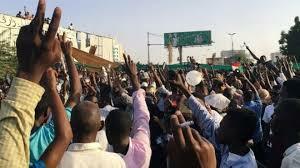 The Sudanese Professionals’ Association (SPA) which has spearheaded the protests, urged supporters to foil any attempt to disperse the sit-in. “We hope that everyone will head immediately to the areas of the sit-in to protect your revolution and your accomplishments,” it said in a statement. A military spokesman also promised not to disperse protesters and said the council was “ready to implement” whatever civilian government the opposition parties agreed. “Gunmen” attacked the anti-government protest at a camp for displaced people about 17km (10 miles) east of the regional capital, Nyala, according to the privately owned Darfur 24 news website. Amjad Farid, an SPA spokesman, told the BBC that they “completely rejected” the military council currently leading Sudan. He said demands included the “full dissolution of the deep state” and the dismantling of state intelligence agencies. Huge change has come to Sudan in just a few days, but the street protesters want more – to ensure the risks they have taken will shape the future of the country. Many concessions have already been made – the arrest of former government figures, new heads of the army, police and the security service, and a promise the opposition can choose a new prime minister. The question is where the line is drawn – between where the demonstrators are satisfied their demands will be met, and the point when the military leaders feel they cannot give any more. In a news conference on Sunday, spokesman Maj Gen Shams Ad-din Shanto said the military council was “ready to implement” whatever civilian government the opposition parties agreed. “We won’t appoint a PM. They’ll choose one,” he said. He also said the army would not remove protesters from their sit-in by force, but called on the crowds “to let normal life resume” and stop unauthorised roadblocks. The pro-opposition umbrella group says it was established to counter Sudan’s mainstream trade unions which stood accused of being pro-government. But its profile was raised on 1 January when it published a Declaration of Freedom and Change, calling for “the immediate unconditional departure of Bashir and his regime”. It has since listed more than 20 civil society groups and opposition parties that have signed up to the declaration. What’s the background to the protests? Mr Bashir’s whereabouts are unknown, but military leaders said he was in a secure place.